Our quiz bird looks like a good match for one of the wood warblers. Working by group, Wilsonia and Oporornis are yellow on the underparts, are unstreaked, and lack wingbars. A single whitish wingbar is clearly visible on our candidate and there's a suggestion of another wingbar below it. The angle makes this second wingbar hard to see but we'll assume it's there. Waterthrushes and Ovenbird have much heavier streaking on the underparts and also lack wingbars. The faint streaking on the sides of the breast and the greenish head might suggest an Orange-crowned Warbler but note the wingbar. Also, there appears to be some streaking on the back just above the one obvious wingbar, something not found on an Orange-crowned, or any other Vermivora for that matter. 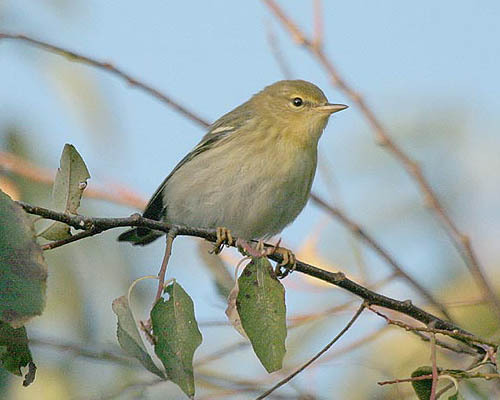 The wingbars and breast and back streaking are however typical of the Dendroica, the largest wood warbler genus north of the Neotropics. Of all the Dendroicas, our quiz bird is most similar to Pine, Bay-breasted and Blackpoll Warblers, a trio that can be difficult to tell apart. Even the dullest female Pine Warbler has a discrete cheek patch, while our quiz bird is very plain-faced. Bay-breasted and Blackpoll Warblers are notoriously difficult to identify in immature and non-breeding plumages, but we can see enough of our Dendroica to tell which one it is. Cutting to the chase, the feet of this bird are obviously pale, which is diagnostic for Blackpoll vis à vis Bay-breasted. Also, a Bay-breasted Warbler would be brighter green on the head and probably wouldn't show as much streaking on the sides of the breast. This Blackpoll Warbler was photographed at Montrose Point in Chicago on September 19, 2006 by Kanae Hirabayashi.